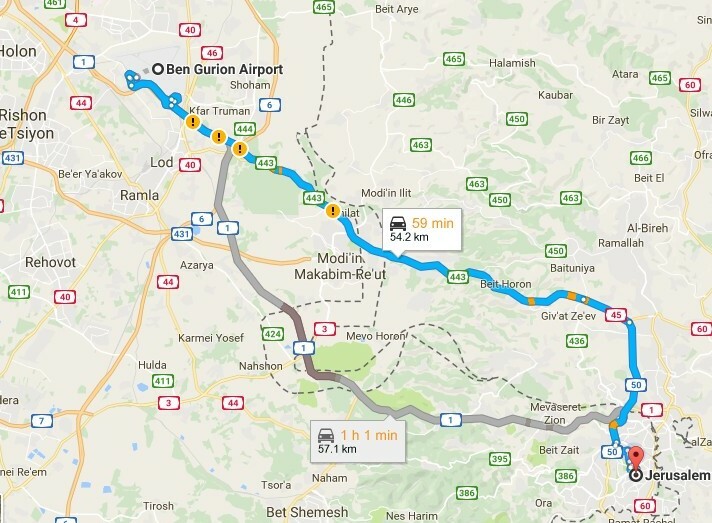 To get to Jerusalem and your apartment from the Ben Gurion International Airport is quite simple. There is ample public transportation-both cabs and buses. The cab stand and bus stops are located right outside the lower level of the airports Terminal 3 Building. At Ben Gurion Airport , take the shuttle bus from your terminal to the Ben Gurion Airport El Al Junction. Egged Bus Number 947 leaves the junction approximately every 20 minutes for the Jerusalem Central Bus Station. The FIRST bus leaves at 6:17 a.m. and the LAST bus leaves at 22:22. The ride to Jerusalem takes about 1 hour and 10 minutes. From Mid February,2017 ,there will be a new DIRECT bus route between Jerusalem and Ben Gurion International Airport. The “AFIKIM” Bus Company will be running a new 24 hour bus line between Jerusalem and the end DIRECTLY at Ben Gurions Terminal 3. The bus number is 485. It will leave from Jerusalem starting at Eliezer Kaplan Street,near the Knesset Building and its Rose Garden,make a stop at Jerusalems Central Bus Station and few more stops on the way and end at the Departures Terminal entrance at the Terminal 3 Building in the airport. From the airport the bus will leave from the Arrivals Exit at Termial 3. The cost will be 16 NIS per person. The buses will have WiFi internet service! Tickets can be purchased IN ADVANCE through the Afikim Website. You can hail a taxi at the official taxi stand right outside the arrival hall of Terminal 3, or call a cab company. If you have lots of luggage, or more than four people in your party, ask for a large vehicle. By law a regular taxi can only take four passengers. The average cost to or from Jerusalem should be about 180 shekels, perhaps a bit more if you have more than two passengers or lots of luggage. If the cab driver quotes a much higher figure, try a different cab. Many prefer to arrange their transportation from the airport in advance. We will be able to provide you with the name and telephone number of reliable drives and services to pick you up on your arrival in Israel.Please be sure to give them your name and arrival details in advance. 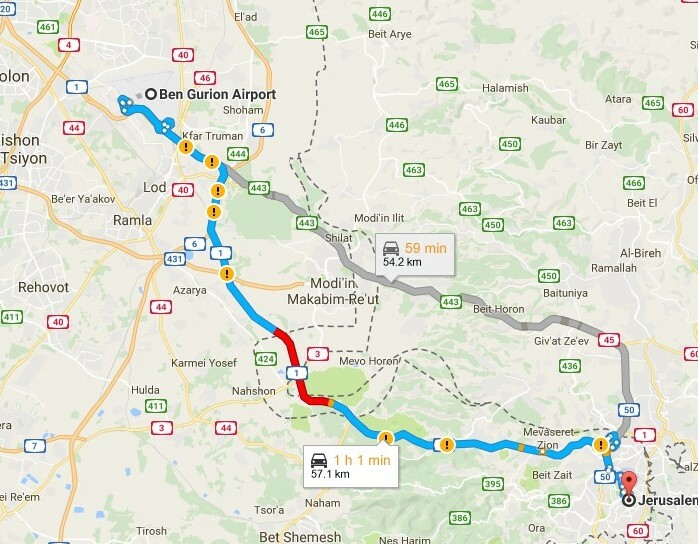 There are 2 Main Highways that run from the airport to Jerusalem. They Are Highway 1 which is the main highway between Jerusalem and Tel Aviv. It enters Jerusalem near the Main Bus Station. The other highway is Route 443 which passes the city of Modiin and enters the city from the direction of Ramot and Har Hotzvim. The ride on either road (without traffic) take about 1 hour. If you have a cellphone with local internet access, we recommend using WAZE to find the best available route! Please contact us in advance for the exact driving directions to get to your apartment!